For our one thousandth puzzle, we've got a particularly challenging task for you. We have posted a few past puzzles in which we have asked players to design peptides and small proteins that are able to bind to a binding site on the Ebola binding protein. The glycoprotein uses this site to latch onto a human cell membrane protein as a first step in invading host cells, which means that something binding at this site should hinder viral entry into cells. Unfortunately, there is a complication: the virus has a defence. 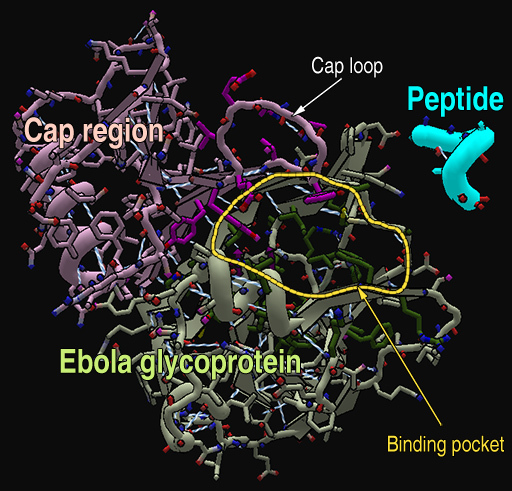 The Ebola glycoprotein, when it is first made, has a "cap" that covers the binding site. This cap is cleaved off just before the virus attaches itself to the human protein that it uses to invade host cells, but it does represent an obstacle if we want a binder to block this site at an earlier stage. We need our binders to bind despite the cap. Fortunately, the loop on the cap that actually blocks the binding site is probably fairly flexible, which means that it could potentially bend out of the way if an artificial binder has enough affinity for the binding site. See the puzzle description on the Foldit website (http://fold.it/portal/node/1998572/) for an image showing the cap, cap loop, and binding pocket. For this puzzle, we're giving you nine starting states, each of which has the loop in the cap that normally covers the binding pocket in a different conformation that exposes the pocket. We want you to dock a five-amino acid peptide into the pocket, and to design the sequence of the middle three amino acid residues. You can switch between the starting conformations by resetting the puzzle. --Use the void view, and try to minimize the number of voids in the pocket by using hydrophobic residues that maximally fill the space. --Interactions with the cap may not be as desirable as interactions with the pocket, since we want our binder to bind whether or not the cap is present. --The usual considerations (good shape- and charge-complementarity between the binder and the pocket, etc.) all apply. Your score should be used as a guide, but it's always possible that the best solution won't have the top score, so use the "share with scientists" button! --The most plausible player designs (whether these are top-scoring or shared with scientists) will be used as a starting point for the design of full-length binders. Update: A few users have pointed out an unintended exploit that allows them to get additional points: if you delete the first and last residues of the peptide, and then add them back, they are now designable residues, permitting you to design five positions instead of the intended 3 (and thereby get more points). This doesn't invalidate the scientific results, but we don't want some people to have an unfair advantage, so we want everyone to know that this exploit exists in this puzzle. Cannot find it in the client's "Select a puzzle" window. http://fold.it/portal/foldit1000 This puzzle will appear when the client update goes out. If you turn on voids in the view menu (as recommended), it's important to turn them off before you minimize the game if you have a script running. If you leave them on, there may be a long delay when you restore the game window during which the game appears frozen. Depending how long the script has been running in the minimized game window, this delay can be many minutes long. If you forget to turn voids off and the game becomes frozen, don't kill the game; it will most likely recover if you let it sit for several minutes. This issue should be fixed with the client update accompanying this puzzle. A minimized client will restore normally now, even with voids turned on. The image showing the cap was there when I first looked at this puzzle page, but is now showing as a broken-image icon. And gives a 404 error when I try to look at the link itself. You have nine different starting configs but we can only share 5 with scientists. It's unlikely that every one of these loop conformations will yield good places to place residues. Pick your favourite and try to focus on that. We gave you 9 because we don't know a priori which will be the good ones and which will be the poor ones. Should the red constraints be resolved (or protein piece so close they are not showing)? No, not necessarily. The constraints are "flat-bottomed" -- that is, there's a penalty for being far from the binding pocket, but once you get close to the binding pocket, the penalty function levels off so that being 1 Angstrom away is no better than being 2 Angstroms away. Just make sure that you're in the pocket and focus on making good contacts. If you view the protein as "Cartoon Thin" and color it using "EnzDes", it looks a lot like in the figure above. The gray "Ebola glycoprotein" parts are labeled A (segments 1-113), the light purple "Cap region" parts are labeled B (segments 114-177), and the blue "Peptide" parts are labeled C (segments 178-182). 178-182 all begin as alanines, and it sounds like 179-181 can be mutated as desired. Can anyone list which segments are considered to be in the "Cap loop" and which segments are considered to be in the "Binding pocket"? @jeff101, it looks like the "cap loop" is segments 122-130. If you orient the cap loop at the top as shown in the image, the binding pocket is the mostly empty area below it. The lower edge of the pocket is something like segments 14-23. How does ebola cleave this cap off ? I suppose that Ebola can "command" the removing of it's cap. Would there be any strategy to remove the cap with a first polypeptide, then to bind with another binding one? I mean allowing us to design 2 separated polypeptides? Re: How does ebola cleave this cap off ? The cap cleavage is actually triggered by human endosomal proteases as the virus is internalized into endosomes in human cells, not by the virus itself. Since endosomes are meant for breaking down matter taken in from outside the cell, the virus needs to get out of the endosome and into the cell cytoplasm, which is what the glycoprotein lets it do. It has evolved to exploit the proteases in the endosome (which normally break down proteins that are internalized) in order to cleave off the glycan cap and expose the glycoprotein binding site, priming the glycoprotein for binding to human membrane proteins as a first step in invading the cytoplasm. Inhibiting the human proteases might also be a stratgy, albeit one that's likely to have a lot of side-effects, since they have a normal role to play in our cells. We don't know for sure why the cap is on there, though it's likely to help the virus to evade the immune system. Making a specific protease that could cleave the cap off for us may or may not have therapeutic benefit, but that's a very hard design problem that's probably beyond the current state of the art in protein engineering. Making specific proteases may someday allow us to tackle a wide range of diseases, but for now, it's a fair way off. This is probably a bit afield of this topic, but are there animals that exhibit immunity/resistance to the virus? If so, do we know what their strategy is? Thanks! Concentrating on attacking the cap? May be, without the cap, the human body can attack the glycoprotein, the reason why the cap is present as a "defense"? Re: Concentrating on attacking the cap? Yes, that is plausible, and has been suggested in the literature. We don't know for sure, but the capped glycoprotein is likely to be better at evading the immune system than the glycoprotein with an exposed binding pocket (which is something that some of the neutralizing antibodies recognize) would be. http://mbio.asm.org/content/5/1/e00862-13.full.pdf This open access paper suggests that there is a small region which is conserved and very similar across the filovirus family. I was trying to work out what popped the cap off as well. I deleted both of Alanine and re-added segments by "Insert" in selection interface. Finally, there are mutable 2 segments like above picture. Moving a design from structure to structure in puzzles like Ebola. It would be interesting to be able to "move/duplicate" a design from structure to structure in a puzzle like this one. I'll mention that to the Foldit developers at our weekly meeting tomorrow. It could be a good feature to have. What Sansyo said is true. Using the design interface, it is possible to delete residues 178 and 182 and then add them back onto the ligand. This allows a player to have 5 mutable residues instead on 3. It also allows for much higher score. Using this method, and my best pose, my score jumped from 10970 to 11022 after a single mutate cycle. It's likely that my score will increase much more than that. Was this a puzzle design oversight, or was it intentional? If unintentional, it seems likely that it will unfairly skew the scores and produce unintended results. Yes, that's a mistake on our part. Thank you for pointing this out. The good news is that I don't think that it will invalidate the scientific results if someone does this; the bad news is that it gives some people an unfair advantage. To keep it fair for everyone, I'm going to modify the puzzle description so that everyone knows about it and has the same opportunity to exploit this if they so wish. be really curious to see if any of the top scores were deep in the pocket, my best are all drifting out. I'll keep trying but maybe the bonus for being deep in the pocket might need adjusting. just to confirm, have been looking through the team shares and the high scores have all drifted out of the pocket. Sorry if this is snarky. But why the British spelling? Is Washington State that close to British Columbia that they use the Queen's English? -- if you delete both the two residues at one terminus and reinsert them, you cannot delete them again (but you can still insert residues, and undoing and resetting the whole structure will enable it again). Even slowing the Gibbs reaction can be a cure ? The human body already creates antibodies to fight off the Ebola infection but Ebola dehydrates the body before it can complete this effort. Yes, exactly. Altering the rate at which the virus infects cells can give the immune system time to fight off the infection.